Coming-of-age novels come with an absolution: They don't actually have to be about-about anything. They can just be. A series of events, linked or otherwise, that start quirky and end artfully or in some combination of that. 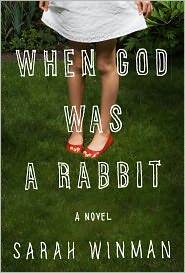 Sarah Winman's debut novel When God was a Rabbit takes advantage of this convention. Technically it’s about a brother and sister; that sister and her best friend; that brother and his best friend with benefits. It has no plot line that looms, waiting to be solved, fixed, redeemed, or rectified, instead it has episodes that must be handled before the next episode or just after. The story centers on Elly, a sassafrass little missy who auditions for the Christmas pageant with a monologue that references booze and abortions, lands the role of an innkeeper, then spontaneously changes the Christmas story mid-performance by assuring Mary and Joseph that there is plenty of room at the Inn, not to mention a view. She also has some thoughts on the illegitimate child. When a life-changing incident occurs, and Elly mentions it to her older brother Joe in an off-handed way, he handles it the best he can and then gives her a gift, a rabbit that she names God. God talks to her, not in the obnoxious way of, say, TV’s Wilfred. Just a sentence or two that provides direction either from his mouth or her imagination. Elly becomes best friends with Jenny Penny, a schoolmate with wild hair and a wilder mother. Jenny Penny is a little bit of a seer, as tamed and subtle in her art as the talking rabbit. Jenny Penny finds stability at Elly's home and the two develop a thick bond that is severed when Elly's father wins the lottery and moves the family far away to the country, to a house that looks like it belongs to rich people and will eventually double as a B&B. Elly keeps in phone contact, but eventually loses touch with her friend when Jenny Penny's mom has them scrambling for new identities and no forwarding address. Meanwhile, Joe goes off to school and later to New York and Elly is left to wander in the woods, delve further and further into herself and just get weird. There is a cast of characters who are taken in by the family: An elderly man with a host of wild stories from his past and a woman who croons showtunes and is most comfortable with a feather boa. In the second half of the book, lost characters return and characters become lost. Winman is super skilled in the art of subtlety. A lot of the biggest reveals in the book are unraveled either without words or backward. Young Elly doesn't tell Joe that she was molested by the next-door neighbor, rather she explains that she knows the difference between circumcised and not and her brother fills in the blanks. Two characters are missing, one calls, it takes half a page to figure out who is on the phone with Elly. And in a fun moment that epitomizes her control with language: Winman writes a chaos scene, a party in which Jenny Penny's mom is out front monitoring traffic and the girls are singing “Bohemian Rhapsody” along with a record. Eventually Jenny Penny's mom's lines sync up to the record and it is done so well and is so aural and visual that it's fantastically exhausting and perfect. This was a good book, a quick read, and a nice introduction to a new writer. ← Mindy, will you hang out with me? Mindy, will you hang out with me?